and I have so much stripey yarn....I just pulled this one off the top of the pile....all wound and ready...here it is by the end of Sunday..almost ready for the heel..which is a new construction for me..
Love those stripey socks. They certainly will give you HAPPY feet when they are done. Hurray for stripes! I've been thinking stripes too and been considering Vanilla Bean socks with sock yarn leftovers ... creating my own self-striping yarn with russian joins! Your needles are MUCH smaller... that's why it only looks like you didn't get as much done. Well that and the fact that she's a super fast knitter! It's not a race though! Love your stripes! My tablet is not so good for answering blogs, hence me only getting round today to answering because I'm on the big computer. What a fun day you must have had! I love fiber outings. Oh, and needle size matters! I think you did a great amount of knitting. I have only done one pair of socks but I want to do more. I am actually taking a one day class by Cat Bordhi in March. She has created a really cool heel called the Sweet Tomato Heel and I want to learn it as it looks like it makes a fabulous looking heel. Have a gerat week--full of knitting and yarn. Oh the fibre event sounds fun. The stripes look lovely. 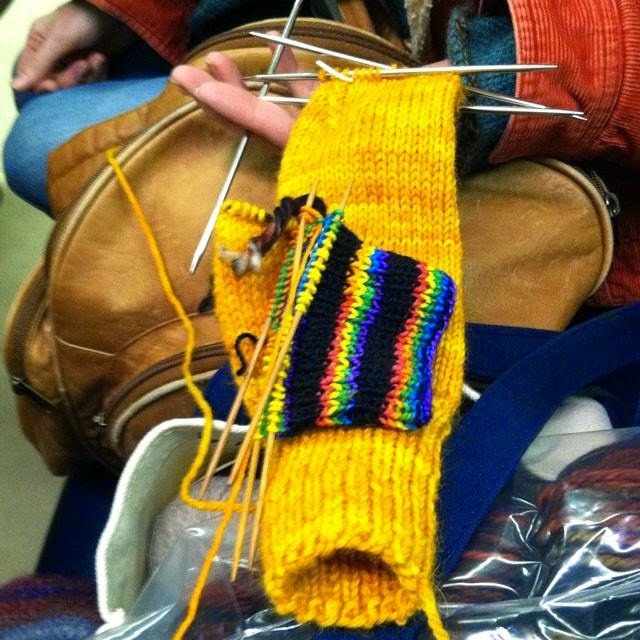 Love the stripy yarn for those socks! I finally taught myself continental knitting this weekend. My guage is baaad, but hopefully it will help me to be faster as it develops! 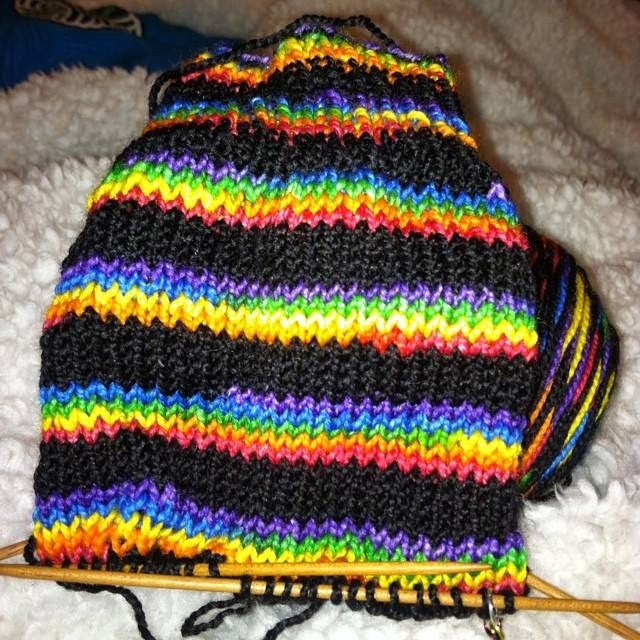 Love that stripey yarn for your socks! You'll be done before you knowit! Love the stripey socks! They'll be done in no time! Happy warm feet! Yay!